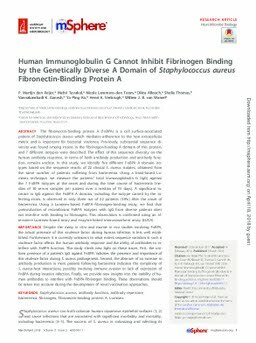 The fibronectin-binding protein A (FnBPA) is a cell surface-associated protein of Staphylococcus aureus which mediates adherence to the host extracellular matrix and is important for bacterial virulence. Previously, substantial sequence diversity was found among strains in the fibrinogen-binding A domain of this protein, and 7 different isotypes were described. The effect of this sequence diversity on the human antibody response, in terms of both antibody production and antibody function, remains unclear. In this study, we identify five different FnBPA A domain isotypes based on the sequence results of 22 clinical S. aureus isolates, obtained from the same number of patients suffering from bacteremia. Using a bead-based Luminex technique, we measure the patients' total immunoglobulin G (IgG) against the 7 FnBPA isotypes at the onset and during the time course of bacteremia (median of 10 serum samples per patient over a median of 35 days). A significant increase in IgG against the FnBPA A domain, including the isotype carried by the infecting strain, is observed in only three out of 22 patients (14%) after the onset of bacteremia. Using a Luminex-based FnBPA-fibrinogen-binding assay, we find that preincubation of recombinant FnBPA isotypes with IgG from diverse patients does not interfere with binding to fibrinogen. This observation is confirmed using an alternative Luminex-based assay and enzyme-linked immunosorbent assay (ELISA).